The sun is currently at the maximum of Solar Cycle 24, but as this graph shows, there are far fewer sunspots during this peak than there have been in past cycles. Though the sun is currently in the peak year of its 11-year solar weather cycle, our closest star has been rather quiet over all, scientists say. This year's solar maximum is shaping up to be the weakest in 100 years and the next one could be even more quiescent, scientists said Thursday (July 11). During a solar maximum, the number of sunspots increases. These dark temporary regions on the surface of the sun are thought to be caused by interplay between the sun's plasma and its magnetic field. Sunspots are the source of the solar flares and ejections that can send charge particles hurtling toward Earth, which can damage satellites, surge power grids, cause radio blackouts and, more benignly, produce dazzling auroras above the planet. About every 11 years, the sun goes through a cycle defined by an increasing and then decreasing number of sunspots. 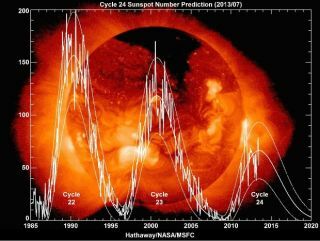 Solar Cycle 24 has been underway since 2011 and its peak was expected in 2013, but there have been fewer sunspots observed this year compared with the maximums of the last several cycles. Giuliana de Toma, a scientist at the High Altitude Observatory in Colorado, said the sunspots occurring during a calm maximum have the same brightness and area as the ones observed during a more turbulent peak. "We just have fewer of them and this is normal," de Toma said during Thursday's briefing. "This is why weak cycles are weak." The quiet maximum is allowing scientists to test their knowledge of how the sun works and hone their predictions of the strength of future solar cycles. "You might think that having a small cycle is disappointing to us but it's quite the contrary," Hathaway said. North-south, or meridional, flows carry magnetic elements from sunspots to the sun's poles, building up the polar magnetic fields until they eventually flip around the time of the solar maximum, Hathaway explained. Scientists are noticing that the strength of the polar fields when a new cycle begins influences the strength of the cycle, he added. For example, weak polar fields observed in 2008 led to the current weak cycle, while strong polar fields in 1986 spawned a strong Cycle 22. The polar fields have been slowly reversing at this maximum, Hathaway said, suggesting that they are not going get much stronger during Cycle 24. This also sets the stage for an even smaller maximum during Cycle 25, scientists believe. "We're seeing fields that suggest the next sun cycle will be even weaker than this one," Hathaway said. A small Cycle 24 also fits in with a 100-year pattern of building and waning solar cycles. Scientists don't know exactly what causes this trend, but there were weak solar cycles in the beginning of the 19th and 20th centuries. Follow SPACE.com on Twitter @Spacedotcom. We're also on Facebook and Google+. Original story on SPACE.com.